Any possible objection you have to boxed wine is wrong, and I am here to tell you why. It's better than you remember. Let's get this out of the way first, because I'm assuming it'll address the largest objection for most of you. You've had wine out of a box before, and it was terrible. Maybe you've even done a Tour de Franzia, the rules of which vary geographically but maintain the same endgame: drink as much Franzia as possible, then wake up a few hours later in a puddle of regret. Here's the thing. Franzia is not boxed wine. Franzia is liquified headache with a splash of pink food coloring. Go to your local supermarket. Hell, go to Whole Foods. Head straight for the end of the wine aisle. There, you'll almost certainly find boxes of wine with fancy labeling and involved typefaces. These are almost uniformly decent or even very good wines that just happen to be in boxes. I'm partial to Bota Box Cabernet, but Black Box also does the trick. And there are endless varieties I haven't tried yet that I'm sure are equally delicious and won't turn your brain into a pain omelette the next morning. It's cost-effective. If you're the kind of person who regularly purchases bottles of wine that even remotely approach a three digit price tag, stop reading this right now and go back to polishing your megayacht's diamond-crusted poop deck. (Also I would love to hang out sometime). For the rest of you who enjoy a glass or two or four to help make it through the week, if you're not buying your wine in box-form you're spending too much money. A Bota Box—just using as an example since that's what's in my pantry right now—costs $20. You can often find it on sale for less. And it holds the equivalent of four bottles of perfectly palatable vino. Since Friday afternoon is not time for math, I'll do it for you. That breaks out to four five dollar bottles. That's cheaper than the Rex Goliath you turn to in a pinch, and Rex Goliath is objectively terrible. It doesn't judge. There are times—and how many of them depends on your stress levels and self-acceptance, but we all have them—that you do not care to keep track of how many glasses of wine you've had. The clear bottle never lies, though; the high-water mark just keeps sinking lower and lower the deeper in you go. But a box! A box keeps your consumption to itself. It's the Doctor Who TARDIS of alcohol; its contents seem impossibly outsized relative to its outward appearance. You couldn't keep strict track if you tried. You just enjoy yourself, in drunken, ignorant bliss, until the day your little plastic faucet runs dry. At which point you pull out your backup box and start all over again. I've never had this one but it looks classy as hell. It's easier to store. It's easy to overlook the box part of boxed wine, or see it as necessarily pejorative. Far from it! Boxes can be stacked, sorted, shoved into closets. They can fit into any level of your fridge, not just awkwardly stuffed in the side-shelving. You can build a fort with them, or turn them into a tiny pyramid. Comparatively, how you're forced to store bottles feels downright antediluvian. Wine racks. Wine refrigerators. Wasteful. Excessive. Chewing up counter space and floor space and wall space and, for the particularly wealthy, cellar space, all of which could go to better use. Can you turn a bottle of wine into a Back to the Future diorama when you're finished with it? I thought not. It's portable. And that's to say nothing of durability! Going camping? Going on a picnic? Going from your car's trunk to your front door? You will have an infinitely easier time carrying a box with you than a bottle, much less four bottles, which is really how much you're carrying, because again, boxed wine contains multitudes. If that amount seems daunting, don't worry; boxed wine isn't just boxes. You can also pick up a single-serve Tetra Pak of boxed wine brands like Bandit and Vendange and a host of others. It's like those coconut water containers, but 12 percent ABV. How many gold medals have you won since 2004? It lasts forever. Okay, not forever. But because the wine inside a box is never exposed to air, it doesn't go through the same oxidization process that bottled wine does the second you open it. That means that while you might squeeze 2-3 days out of a bottle of wine, you've got a solid month after your first pour to work through your average box. No one cares. I'm not under any illusion that I'm breaking new ground by declaring my love for wine that comes out of a box. Plenty of others have before me, plenty will after. There's just no stigma to it anymore, no reason to feel like you're drinking something lesser just because it doesn't have a cork. 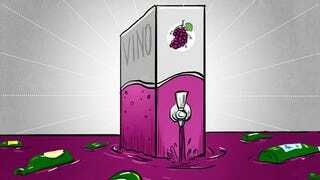 In fact, the worst thing you can say about most boxed wine today is that you can't drink it ironically anymore. Which I guess means that Franzia's still good for something after all.